Fifa president Gianni Infantino has explained some of his efforts towards championing reform, including the removal of a wine cellar. Infantino was elected Fifa president in February. FIFA PRESIDENT GIANNI Infantino had a wine cellar converted and antique furniture removed from his office as part of his pledge to champion reform in the organisation. The former Uefa general secretary was elected in February as successor to the disgraced Sepp Blatter, who is serving a six-year ban from football after being found guilty of a breach of ethics relating to a payment made to ex-Uefa chief Michel Platini in 2011. Infantino was investigated by Fifa’s Ethics Committee over alleged breaches of conduct, which included a failure to sign an employment contract and flights taken during the first few months of his presidency. The 46-year-old was cleared of any possible violation, however, and has now spoken at length about his attempts to inspire FIfa’s clean-up operation from within – starting with alterations to Blatter’s office. He told Blick: “I wanted to replace the heavy baroque furniture in my predecessor’s office. In the next room, there was a wine cellar and a sofa. “I wanted to customise the office to my needs. I said: ‘Look in the store room, there will probably be something there we can use’. 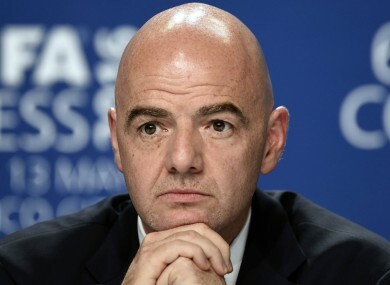 Infantino caused further controversy when he was quoted as saying that a proposed CHF2million payment offer was “insulting” – an issue that reportedly caused further tension with former Fifa Audit Committee chairman Domenico Scala, who later left his role. But Infantino, who is waiting to be paid while Fifa’s compensation commission decides on an appropriate salary for top officials, has attempted to clarify his remarks. “The truth is I just found the procedure to be an insult. It’s completely random,” he said. Infantino admits he was “hurt” by the allegations of ethics violations, which included claims that he took several flights on private jets during his opening few months in the role. The former solicitor feels he was the subject of attacks by those who were wary of his reform proposals, ones that he says were treated as mere ”PR exercises” by Fifa in the past. “I underestimated the targeted attacks of certain people and, yes, it has hurt me a little,” he said. ”The independent ethics committee investigated all these allegations meticulously, and cleared me completely. “My personal wish is that every stone is turned over. This is not aimed at individuals and certainly not personally motivated; it would allow a new beginning and therefore reforms. That’s my job, my goal. “In this case [of the flight], it was just a coincidence. I have a friend who has nothing to do with Fifa and football and he offered me the flight. “I was chosen during the most difficult time for Fifa. It’s spoken for years about reforms, but these have mainly been PR exercises. But when I went to make them, serious attempts were made to discredit me and to undermine the reforms. “Who and why, you ask? Maybe those who are afraid that some things will come to light. “The most important thing is that all cash flow is disclosed and made transparent. Every franc that comes in, every franc that goes out. What sort of shape are the Ireland squad in ahead of next week’s World Cup qualifier? Email “Gianni Infantino has Sepp Blatter's wine cellar removed as part of Fifa reform commitment”. Feedback on “Gianni Infantino has Sepp Blatter's wine cellar removed as part of Fifa reform commitment”.